The seductive allure of the mythical Greek Sirens is legendary. Famed and renowned for their musical voices and instrument skills, the Sirens would lure sailors off their course, drawn by the music and enchanting voices, the sailors would be so distracted, they would often crash their ships and boats on rocky coastlines. The Sirens were cited as only two in Homer’s Odyssey but later tells have numbered them as anything from three to five, of course no one truly knows the number of the Sirens, their musical allure would have the beating heart of anyone that heard it and could not resist. the Sirens would tempt their prey with enchanting songs and notes, luring them to their island, the music would be whimsical and twinged with sad but at the same time seductive tones. Because of their ability to draw sailors the sirens were often associated with death, but many tales talk of how the Sirens would not kill themselves. Instead the sailors if they survived the shipwreck would often find the music of the Sirens so seductive they would be unable to leave the island, or even move, as if transfixed by the sound. While the Sirens have both been cited as being part women and part fish, and also part woman and part bird, neither can truly be confirmed, as near all who have seen the Sirens have perished as their musical prowess. The word Siren is many languages like Spanish, Portuguese, French and Italian is incredibly similar to mermaid is not a coincidence. 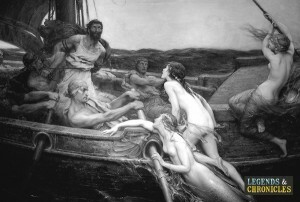 However the tales of the sirens never allude to their mermaid qualities, and were considered to be land bearing women whose goal was to entice men to their island. In other stories and poems from the Roman author Ovid, the Sirens are alluded too as bird like creatures, that were companions of Persephone, and used their wings to search for her when she was lost. In much of the early Greek art that depicts Sirens, they are also imagined as part woman, part bird creatures, either featuring bird like wings, and in some cases even bird like claws instead of feet. Either way the appearance of the Sirens was not what drove men to be obsessed and fascinated with them, it was their mastery of music and their haunting voices. The Sirens have been covered by in mythology many times from the Greek poet Homer, who mentioned the Sirens in his Odyssey. They were also mentioned by Apollonius Rhodius in the Greek poem Argonautica, where Jason was warned about the lure of the Sirens, and that they would need to plan a strategy to avoid temptation from their music. Later the Sirens would be mentioned by Roman poets and many famous authors due to their interesting story, and alluring mythology. 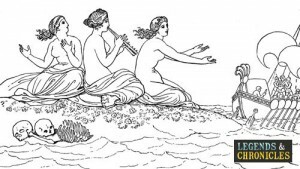 The Sirens to this day still remain one of the most interesting Greek mythological stories, and of course should you ever happen upon them, don’t forget to ensure you don’t listen to the song too long.